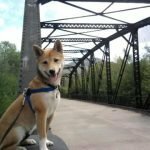 I have a 2 year old Shiba Inu named Corner who has the name for a reason… Julie was an amazing dog trainer and a very professional person! I have never gone to a trainer or had one come to the house before because I was afraid of how they would treat Corner since he is like a kid to me. But I knew Corner would not benefit from something like pet store training because of two things; he already knew basic commands, and his behavior is totally different out in public versus being at home. I found Julie online and chose her specifically because of her training philosophy. I didn’t want Corner to be punished during training and Julie’s training program is based upon rewards. I am very impressed with this experience. Corner has had three sessions so far and has had remarkable improvements! He is a very smart/stubborn little guy and Julie knew just how to handle his antics. I highly recommend her to anyone! Its well worth it!